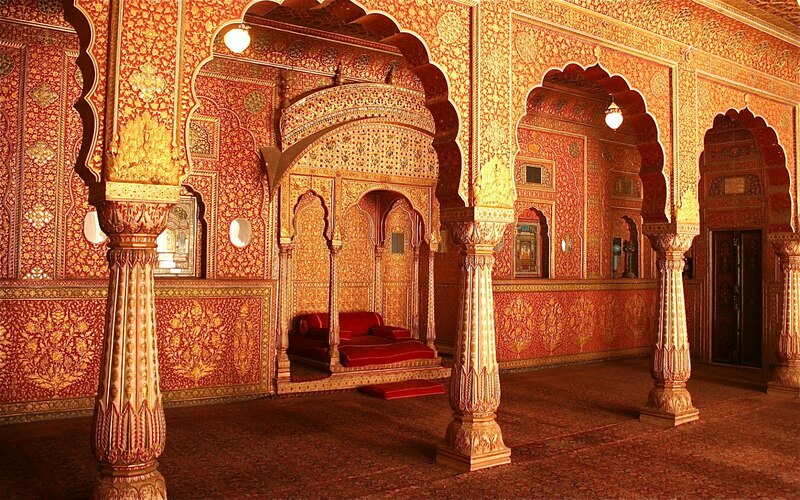 The desert city Bikaner was founded by Rao Bika around 15th century. Prior to that period, Bikaner was under the Jat rule. It is said that the ‘Jangladesh’ mentioned in the Mahabharata (in the Bhishma Parva) was none other than the present day Bikaner. Around 1465 Rao Bika of the Marwar dynasty (Rathores) separated from his father (Rao Jodha) to build his own kingdom. With the help of his supporters Rao Bika built his kingdom in the Jangladesh region. The city was named after him and thus came to be known as Bikaner. There were frequent clashes between the Marwar kingdom and the Bikaner kingdom. Rao Bika made frequent attacks on the Marwar proclaiming his rage against his father. The rule of Bikaner had acquired full control over the local rulers such as the Jats up until the Mughal invasion. Rao Bika died in 1504. The later rulers of Bikaner established a cordial relationship with the Mughals of Delhi to attack the Marwar clan. During the Mughal period the rajas of Bikaner became the most trusted allies of the Mughals. After the Mughal rule the British took advantage of the circumstances and as a result the Bikaner kings signed a Treaty of Perpetual Friendship with the British in 1818. It is called the subsidiary alliance. Later by the frequent threats from the Thakurs the Bikaner rulers had to take the support of the British which lasted till India gained its independence. The Rajas of Bikaner assisted the British as political agents and the British gained both financial and military support from the rulers without any obstacles. In the period of Ganga Singh (1880- 1943) the Bikaner region saw great developments in terms of civic amenities and the economic growth. Ganga Singh was English educated King who had gained the confidence of the British to the full extent. Railway line was built during this period. After independence the last ruler of the Bikaner Raja Sadul Singh chose to sign the Instrument of accession (legal formalities for the former Princely States to join either India or Pakistan) and chose to be with the Indian Government. Now, Bikaner is part of Rajasthan State.